The Roman stational church of today’s Mass is the Basilica of Saints Cosmas and Damian. Who were Cosmas and Damian? Tradition has it that they were twin brothers martyred in the third century, Arabs by race, and physicians, practicing their profession without claiming payment from their patients. Hence they were known as the “moneyless” or “unmercenary” physicians. Their knowledge of medicine was, according to tradition, perfected by their faith in Christ. Saints Cosmas and Damian were known to heal, by the power of Christ, cases of disease which others had pronounced hopeless. Ultimately, Cosmas and Damian gave their lives in witness to the Divine Physician Christ. They were first honoured in the East, and by the sixth century they had their own basilica in Rome where they are depicted in mosaics which can still be seen today. This, then, is some of the background of today’s Holy Mass. It becomes clear that the Introit was chosen in reference to the healing gifts of the Holy Physicians Cosmas and Damian. The first word of the Introit is salus, that is, health. I am the health of My people, saith the Lord, in whatever tribulation they shall cry to Me, I will hear them, and I will be their Lord forever. John 6:35—I am the bread of life. John 8:12—I am the light of the world. John 10:9—I am the door. John 10:11—I am the good shepherd. John 11:25—I am the resurrection and the life. John 14:6—I am the way, and the truth, and the life. John 15:5—I am the vine, you are the branches. The psalm verse chosen to accompany the antiphon also merits close attention. It is taken from Psalm 77, the long account of God’s faithfulness, and of His providence, and of the disobedience and ingratitude of His people. Christ, the Divine Physician, invites us to incline our ears to the words of His mouth. And what does He say? Salus Populi Ego Sum. Spes. Hope. Our Lord would have us understand that today no one is sent away hopeless, that there is a remedy for every ill, an antidote for every poison, and grace for every infirmity. In the hands of the Divine Physician, and nourished by the healing remedies of His adorable Body and Blood, who among us can remain without hope? 17 Feb. 18 June. 18 Oct.
On the Festivals of Saints, and all other solemnities, let the Office be ordered as we have prescribed for Sundays: except that the Psalms, antiphons and lessons suitable to the day are to be said. Their number, however, shall remain as we have appointed above. Chapter XIV, in the Latin text, is a single sentence. What emerges from Chapter XIV of the Holy Rule is that the saints, through the liturgy, were present in the life of our father Saint Benedict, as they have been present, through the liturgy, in the lives of his sons down through the ages. The feasts of the saints and the related veneration of their holy relics are opportunities given us by the liturgical providence of God to intensify our communion with the Church triumphant. The saints are more present to us than we to them; they are ever ready to help us, guide us, and intercede for us. We are not always aware of their presence nor of their intense activity on our behalf, but being in the light of glory, they “neither slumber nor sleep” (Psalm 120:4). Our Lord gives specialised tasks to His saints. The Church recognises this by attributing to certain saints a patronage over places, groups, and particular needs. Our Lord engages the saints in the ministrations of His merciful love to souls. The life of the saints in heaven is one of cooperation with Our Lord in His two-fold mediation as Eternal High Priest. Through Him, and with Him, and in Him, they glorify and praise the Father in the ceaseless liturgy of heaven. At the same time, through Him, and with Him, and in Him, they dispense graces to souls and intervene with a perfect love in the lives of those who journey as pilgrims on the earth. Our Lord has charged His saints to walk with us, to attend to our needs, to obtain for us the graces of repentance, and illumination, and union with Me that He so desires to give us. Some of these saints, though not all of them, are known to us. The saints adopt us, so to speak, some as brothers others as spiritual sons. The interest of the saints in all that we do, and say, and suffer is continuous. The saints are, at every moment, attentive to us. The first and indispensable expression of devotion to the saints is the celebration of their feasts. Each feast brings with it a grace that is proper to it. Through the antiphons, and responsories, and hymns, and collects of the saints, we effectively call upon them, we ask for their help and, thus, we begin to benefit from their example, to live according to their doctrine, and to walk in their company. We can hope, one day, to be united with the saints in the glory of heaven where the radiance of the Face of Christ, the brightness of the Lamb, will fill our souls with an ineffable joy. Invoke the saints whom Our Lord has already brought into your life and remain open, for there are others whom He will present to you, and to whom He will entrust you in the years to come. The repetition of the Sanctoral cycle of the Divine Office is a yearly opportunity to renew our friendship with the saints and to receive from them the particular alms of grace that it pleases Our Lord to distribute by their hand. 5 Feb. 6 June. 6 Oct. The eighth degree of humility is, for a monk to do nothing except what is authorised by the common rule of the monastery, or the example of his seniors. A brother asked an Elder: “If I am living together with other brothers and I see something inappropriate, am I to say something?” The Elder replied: “If they are older than you, or of the same age as you, it is better to remain silent, for you will be at rest. In such a circumstance, consider yourself younger than they and remain heedless. It sometimes happens that a young brother, in the flush of enthusiasm that rightly accompanies a man’s first steps in the monastic life, falls into rash judgment and criticism of his elders. A brother more easily falls into this sin when his head is stuffed full of the beautiful and lofty notions found in books without the breaking of the heart that opens a soul to grace. Sacrificium Deo spiritus contribulatus; cor contritum et humiliatum, Deus, non despicies. More often than not the heart is broken by the experience of failure, humiliation, infirmity, rejection, and loss. A monk thanks God for everything by which he is brought low in his own eyes and in the eyes of others. A monk praises God when it is made apparent that, left to himself, he is capable of nothing. A monk glorifies God when others see his infirmity and point out his failures. A monk rejoices when, because of some sin, he is reduced to nothing and obliged to go to God empty–handed, soiled, and humiliated. Break my heart in pieces, that, all its sin and all its uncleanness cast out, it may become like a scoured tablet, upon which the finger of God may write the law of His love, in the presence of which no iniquity may find a dwelling place. A monk is practising the eighth degree of humility when he sees that nothing pleases God more than the sacrifice of a broken heart. A monk is practising the eighth degree of humility when, refusing to judge his elders, he imitates whatever good he sees in them and follows with simplicity and joy the customs they have handed on to him. A monk is practising the eighth degree of humility when he cultivates a love for the saints of our Order, imbibes their doctrine, follows their example, and seeks their intercession. I sometimes think of the saintly Benedictines of the last century or, at least, of those whose lives are known to us and whose reputation for holiness is not altogether forgotten. The better known of these would be Dom Pie de Hemptinne (1880-1907); Blessed Placido Riccardi (1844–1915); Blessed Fortunata Viti (1827–1922); Blessed Columba Marmion (1858–1923); Mother Mary of Saint Peter Garnier of Tyburn (1838–1924); Brother Meinrad of Einsiedeln (1848–1925); Father Lukas Etlin (1864–1927); Venerable Caterina Lavizzari (1867–1931); Dom John Chapman (1865–1933); Abbot Celestino Maria Colombo (1874–1935); Blessed Ildephonsus Schuster (1880–1954); Oblate Itala Mela (1904–1957); Mother M. Hildegarde Cabitza of Rosano (1905–1959); Dom Eugène Vandeur (1875-1967); Venerable Hildebrand Gregori (1894–1985); and Dom Gérard Calvet of Le Barroux (1927–2008). I mention only these without forgetting the Benedictine Martyrs of Tanzania (1889); of El Pueyo (1936) and of Santo Domingo de Silos (1936); and of Korea (1949–1952). Saint Aelred, the English 12th century abbot of Rievaulx, has long been a dear friend. “Our order”, he wrote, “is the Cross of Christ.” In saying this, Saint Aelred uses the word order to signify, not an institutional organization, but a way of life. For Saint Aelred, the Cross of Our Lord Jesus Christ is the very pattern of monastic life. It is the singular and supreme glory of the house of Rievaulx that above all else it teaches tolerance of the infirm and compassion with others in their necessities. All whether weak or strong should find in Rievaulx a haunt of peace, and there, like the fish in the broad seas, possess the welcome, happy, spacious peace of charity. You know, Lord, my heart. You know that my desire is to devote wholly to their service whatever you have given your servant; to spend it completely for them. You know also that I am ready to be myself wholly spent, poured out, for them. May all I perceive and all I utter, my leisure and my occupation, my thoughts and my actions, my prosperity and my adversity, my life and my death, my health and my sickness, yes all that I am be spent on them, be poured out for them, for whom you yourself did not disdain to be poured out. Grant me, Lord, through your grace that is beyond our understanding, grant that I may bear their infirmities with patience, that I may have loving compassion for them, that I may come to their aid effectively. Taught by your Spirit may I learn to comfort the sorrowful, confirm the weak and raise the fallen. May I be myself one with them in their weaknesses, one with them when they burn at causes of offense, one in all things with them, and all things to all of them, so that I may gain them all. And since you have given them this blind leader, this unlearned teacher, this ignorant guide, if not for my sake then for theirs teach him whom you have made to be their teacher, lead him whom you have bidden to lead them, rule him who is their ruler. Saint Aelred’s biographer and friend, Walter Daniel, describes the abbot’s death. Saint Aelred’s last words were, “Festinate, for Crist luve.” Walter Daniel explains: “He spoke the Lord’s name in English, since he found it easier to utter, and in some way sweeter to hear in the language of his birth.” “Festinate, for Crist luve.” Hasten, for Christ’s love! I want to make Saint Aelred’s words at the hour of his death my own as I approach the adorable mysteries of Christ’s Body and Blood. Holy Father Saint Aelred, obtain for us today a threefold grace: willingly to go to Christ our Physician, tenderly to love Christ our Friend, and fervently to adore Christ our God. 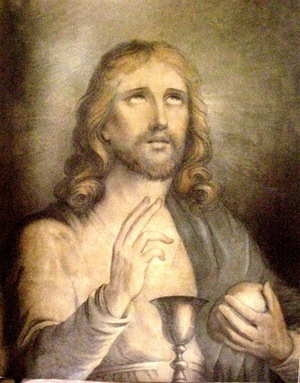 William Magee Seton gave this lithograph of Christ the Redeemer to his beloved wife, Elizabeth Ann Seton, sometime between 1774 and 1803. Its Eucharistic theme prophetically reflected the profound devotion to the Most Holy Eucharist that would characterize her piety as a Catholic. 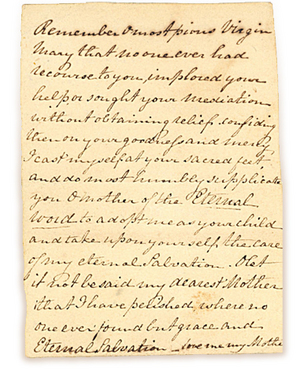 Below is a photograph of a copy of a variant of the Memorare handwritten by Elizabeth Ann Seton. At the end of text she added the touching plea, “Love me, my Mother. The Filicchi home contained a private chapel where the Blessed Sacrament was reserved. Elizabeth was drawn to the tabernacle. Even before her mind had been instructed in the mysteries of the Catholic faith, her heart recognized the living presence of the Lord in the Most Holy Eucharist. Her American Protestant sensibility was perplexed and, yet, she could not deny her heart’s fascination with the Lamb of God hidden beneath the sacramental veils. Elizabeth’s long personal memoir, The Italian Journal, recounts the intimate details of her inner struggle and conversion to Catholicism. Elizabeth and her ten year old daughter, Anna Maria, returned to New York on June 3, 1804, accompanied by Antonio Filicchi — a man to whom Elizabeth had become deeply attached. He had become for her a friend and a spiritual counselor. In spite of the hostility of her family and the sneering disapproval of New York society, Mrs. Seton made her profession of faith as a Catholic in the old Saint Peter’s Church on Barclay Street in Lower Manhattan on March 14, 1805. The Reverend Matthew O’Brien received her into the Catholic Church. She returned home feeling, in her own words, “light of heart and cool of head, the first time these many months.” She asked Our Lord to wrap her heart “deep in His open side,” or “lock it up forever in His little Tabernacle.” Two weeks later, she received her First Holy Communion. The Divine Dweller of the tabernacle came to dwell in her heart. The rest of Elizabeth Ann Seton’s life is well known: her sufferings from the rampant anti-Catholic prejudice in New York; her move to Baltimore; the beginnings of an American Sisterhood modeled after Saint Vincent de Paul’s Daughters of Charity. Elizabeth obeyed. She came to the one, holy, catholic, and apostolic Church. She submitted to the authority, teaching, and care of the Successor of Peter and of the bishops in communion with him. 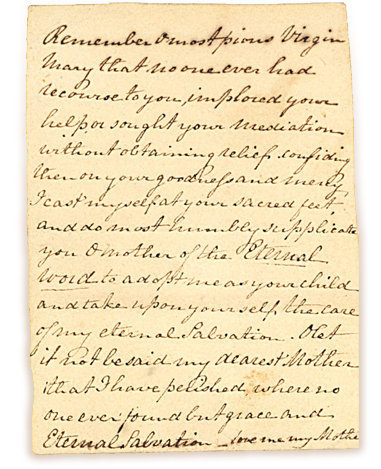 In the words of the Gospel, “She came, and saw where He abode, and she stayed with Him that day,” and not that day alone, but every day until her death at the age of forty-six on January 4, 1821. Elizabeth Ann Seton was, more than anything else, a Eucharistic soul. She was converted by the Eucharist. Her first instructions in the Catholic faith emanated from the silence of the tabernacle. As she went forward, following the Lamb of God wheresoever it pleased Him to lead her, Eucharistic adoration marked her spiritual journey more and more until, in the final years of her life, she was often seen in ecstatic adoration of the Real Presence. Paradoxically, it is this thoroughly American saint, who, by her devotion to the Mother of God, her attachment to the Mystery of the Eucharist, and her obedience to the Chair of Peter, offers the antidote to the errors of “Americanism,” condemned by Pope Leo XIII in 1899. The underlying principle of these new opinions, declared the Pope, is that, in order to more easily attract those who differ from her, the Church should shape her teachings more in accord with the spirit of the age and relax some of her ancient severity and make some concessions to new opinions. Many think that these concessions should be made not only in regard to ways of living, but even in regard to doctrines which belong to the deposit of the faith. They contend that it would be opportune, in order to gain those who differ from us, to omit certain points of her teaching which are of lesser importance, and to tone down the meaning which the Church has always attached to them. It does not need many words, beloved son, to prove the falsity of these ideas if the nature and origin of the doctrine which the Church proposes are recalled to mind. Situated amidst pasture land and forest in the eastern reaches of County Meath, Silverstream Priory was founded in 2012 at the invitation of the Most Reverend Michael Smith, Bishop of Meath, and canonically erected as an autonomous monastery of diocesan right on 25 February 2017. The property belonged, from the early 15th century, to the Preston family, premier Viscounts of Ireland and Lords of Gormanston. In 1843 Thomas Preston (1817-1903), son of Jenico Preston, the 12th Viscount (1775-1860), built what today is Silverstream Priory. Silverstream Priory is a providential realisation of the cherished project of Abbot Celestino Maria Colombo, O.S.B. (1874–1935), who, following the impetus given by Catherine–Mectilde de Bar in the 17th century, sought to establish a house of Benedictine monks committed to ceaseless prayer before the Most Holy Sacrament of the Altar in a spirit of reparation. 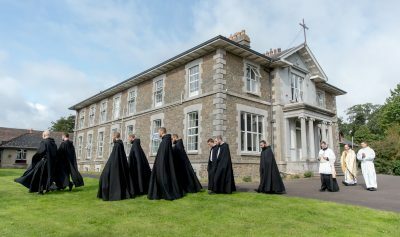 The community of Silverstream Priory holding to the use of Latin and Gregorian Chant, celebrate the Divine Office in its traditional Benedictine form and Holy Mass in the “Usus Antiquior” of the Roman Rite. Praying and working in the enclosure of the monastery, the monks of Silverstream keep at heart the sanctification of priests labouring in the vineyard of the Lord. They undertake various works compatible with their monastic vocation, notably the development of the land and gardens, hospitality to the clergy in need of a spiritual respite, scholarly work, and publishing. © 2013-2018 Silverstream Priory. All Rights Reserved.